Paul loads the Wireshark CSV output into Excel and uses formulas to calculate the difference between network request and response times. The CSV output could just as easily be loaded into a SQL Server table and the same values calculated using subqueries or analytic functions. Paul charts the results in Part 3 of the video. There’s a good illustration of blocking in one of the charts. Earlier posts described how you can collect and analyse waits to identify resource limitations and constraints for your SQL Servers. This post outlines a similar approach for identifying workload impact. In many cases we use server side traces to answer questions such as ‘what is running against my SQL Server ?’. Such questions normally arise as a result of performance issues affecting a front end application. When used with event and column filters SQL traces are very good at identifying specific troublesome queries. Extended events, as an alternative to traces, also meet this requirement. But to answer a very high level question such as ‘has my workload on this server increased or decreased ?’ using traces you’d have to capture practically all queries and analyse the results using tools such as SQL Nexus and RML utilities. There are caveats to using sys.dm_exec_query_stats. Because the statistics are associated with cached plans certains executions will not have their statistics stored. For example, last_execution_time, execution_count etc won’t be updated if you execute a stored procedure WITH RECOMPILE. Certain commands will not have query statistics entries – BEGIN TRAN, ROLLBACK TRAN, DBCC, BACKUP etc. The only way to deal with these missing entries is to capture the entire workload using traces. The downside is the potentially tens of gigabytes worth of trace files that can be generated for busy systems. So, using query statistics for the analysis we trade off some of the commands we may miss for the saving in disk space and overhead of processing a potentially large number of trace files. Gauging the impact of missing commands is fairly straightforward. You compare a trace analysis with a query statistics analysis. If total reads, total duration, total cpu from a trace analysis match the corresponding totals from a query statistics analysis then for the given workload you’ve validated the query statistics approach. Having set the background we’ll move on to describe one approach to collecting and analysing data from sys.dm_exec_query_stats. In SQL 2008 and above we have the query_hash column. Grouping on the query_hash, statement start offset and statement end offset we can aggregate the values for execution count, total work time, last reads etc to measure the workload hitting your SQL Server. To minimise the impact of statistics collection the approach listed here does not fetch the actual query text. This can easily be obtained once the overall workload picture is presented. [System.DateTime]$querystatslastfetch = "01 January 1990"
Notice in the sys.dm_exec_query_stats prepared statement I’m setting the total_rows, last_rows, min_rows,max_rows columns to zero. These columns are only available in SQL 2008 R2 and higher. The code can be changed to dynamically include or exclude these columns based on the target server being examined. As mentioned early, to minimise the impact on the target server the collection process does not fetch the actual query text. Once you’ve identified a query of interest you use its QueryID to fetch the query_hash from dimQuery. You then examine the target server’s DMV to get the full query details (the text, the plan, the plan attributes etc). If you’re only interested in statistics at the procedure level and not at the individual statement level then a similar collection and analysis based on sys.dm_exec_procedure_stats can be performed. This simple approach to collecting and analysing query statistics will reveal interesting details about your SQL Server workloads. Regular patterns will emerge. Together with the wait, latch and spinlock analysis you should now have a complete picture of your SQL Servers. The previous blog post outlined an approach for collecting wait type, latch and spinlock statistics. 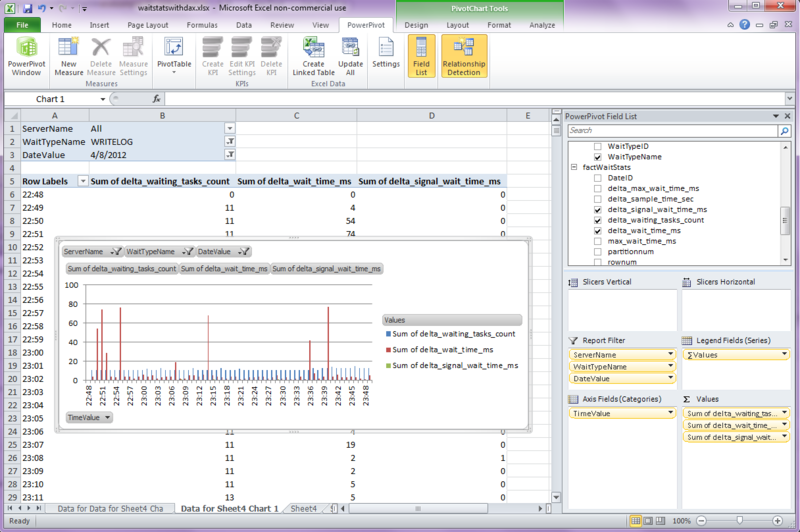 This post shows how the collected statistics can be analysed and graphed. In versions prior to SQL 2012 you could use CTE’s, views, subqueries, CROSS APPLYs to obtain the deltas. Having obtained the deltas you can use the relationships between the dimension tables and the fact tables to graph the figures that you are interested in. I won’t go into the details of these DAX statements but you can see they are all of the same form. The only difference in them is one column name. The single partitionnum column saves us from having to type [ServerID]=EARLIER([ServerID]) && [WaitTypeID]=EARLIER([WaitTypeID]) in each definition. In other words, we import partitionnum using our source SQL statement and trade off some very minor storage cost for code simplification. In my case the statistics are read every 60 seconds so the deltas are relative to this sampling interval. 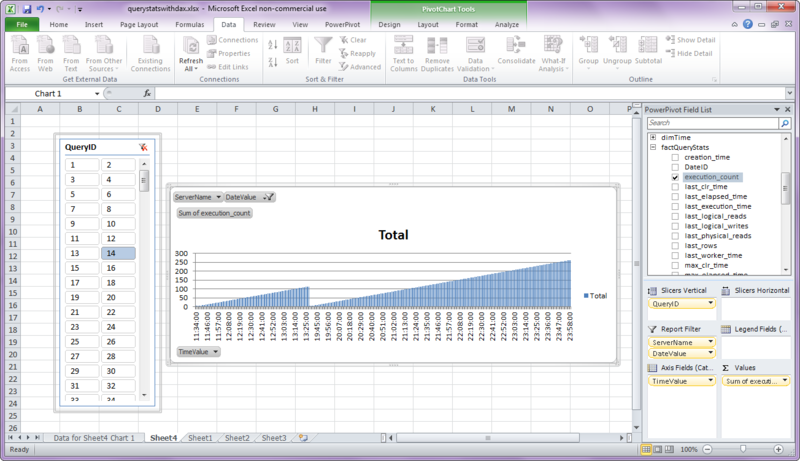 You could use calculated measures in the pivot tables and charts to account for the sampling interval. All sorts of simple dashboards could be created using the approach listed in this post. Collecting wait type, latch and spinlock statistics and analysing them in this way gives you a true picture of the workloads your SQL Servers have to deal with and the resource limitations they face. Collecting and charting wait type, latch and spinlock statistics gives you a true picture of how busy your SQL Servers are and the resource limitations they face. Such statistics will either verify or contradict an application owner’s view of their SQL Server. For example, blocking is forecast to be high during certain times in the morning but now you are observing blocking running into the afternoon. Similarly, you know CPU and writes to the transaction log can be high in the early hours of the morning but now you are observing them to be high up to mid morning. The wait type, latch and spinlock statistics, if gathered historically and analysed correctly, provide a quick and easy way to confirm and compare performance. There are many commercial products available which collect wait type, latch and spinlock statistics. Collecting these statistics using your own code is fairly straightforward. What follows is one possible approach. 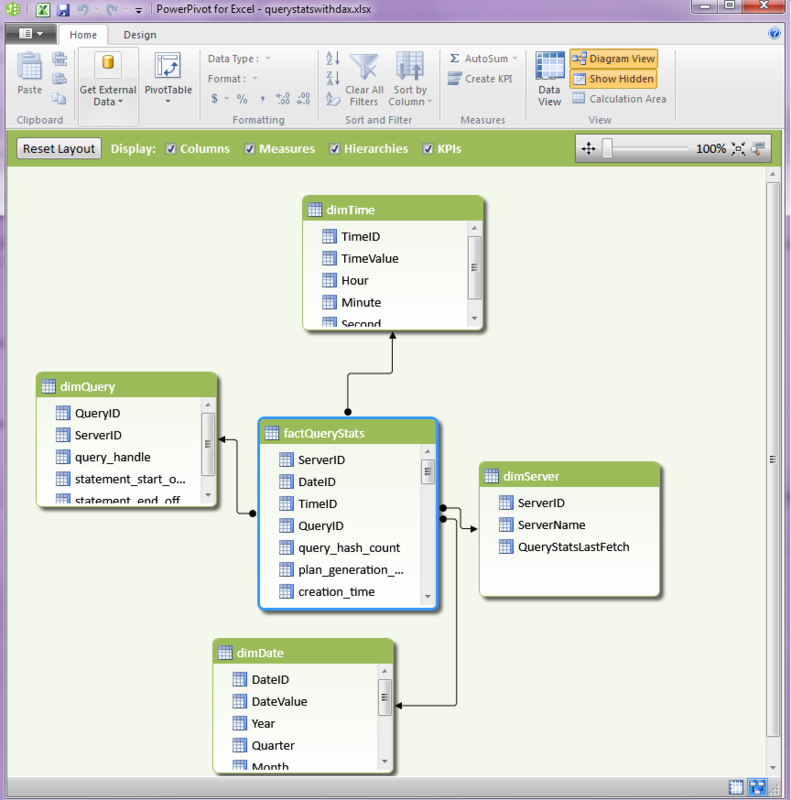 We can make use of a centralised data warehouse for collecting statistics. The dimension tables will hold the static attributes – server names, dates, times, wait type names, latch class names, spinlock names. The fact tables will hold the measures – waiting task counts, wait times etc. The largest tables in terms of rows counts will be the fact tables. Not having repeated string name columns in these fact tables will result in large space savings as our history builds up. -- Pre-populate with wait_type names from the different versions of SQL Server at your site. -- Pre-populate with latch_class names from the different versions of SQL Server at your site. -- Pre-populate with spinlock names from the different versions of SQL Server at your site. $sql = "SELECT CAST(SERVERPROPERTY('ServerName') AS sysname) AS ServerName,GETDATE() AS SampleDateTime,* FROM sys.dm_os_wait_stats"
$sql = "SELECT CAST(SERVERPROPERTY('ServerName') AS sysname) AS ServerName,GETDATE() AS SampleDateTime,* FROM sys.dm_os_latch_stats"
$sql = "SELECT CAST(SERVERPROPERTY('ServerName') AS sysname) AS ServerName,GETDATE() AS SampleDateTime,* FROM sys.dm_os_spinlock_stats"
This script is hardcoded to collect statistics from a target server named TARGETSRV. The collected statistics are stored in the data warehouse database named DBAdwh on server DWHSRV. You can set TARGETSRV to be equal to DWHSRV. You’d then have a local collection. All time values are local to the server being sampled. The code required for collection of statistics seems quite lengthy. It’s not as bad as it seems when you consider that large chunks are simple repetitions to cater for three different types of statistics. The next post will show how the statistics can be analysed.